On Saturday we held the first of two meetings with a dozen (plus a few) teachers who will help Densho test our civil liberties curriculum units in their classrooms this year. A grant from Washington Civil Liberties Public Education Program is underwriting a project to evaluate the effectiveness of new lessons we've created to align with Classroom Based Assessments (CBAs) for social studies. Thank you to our "test kitchen" teachers! The diverse team of teachers is top flight -- with representation from multiple districts and various grade levels and subjects. 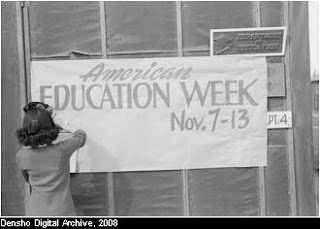 The critical thinking these teachers will encourage is a far cry from the "Americanization" indoctrination Japanese Americans underwent in the incarceration camps. We can't wait to hear how the students respond to the lessons on immigration issues, critical assessment of the media, and those all-important constitutional principles. See this issue of Colors NW for a recap of the teacher workshop.